During the real earnings season, we find many companies whose reported earnings overstate economic earnings,. On the other hand, we also find many companies where reported earnings understate economic earnings. This disconnect can lead to undervalued stocks and great buying opportunities for investors. During the real earnings season, we find many companies whose reported earnings overstate economic earnings, or the true cash flows. This disconnect can lead investors to believe a stock is cheaper than it truly is, as in the case of our recent Danger Zone, "Finding Danger in the Footnotes." On the other hand, we also find many companies where reported earnings understate economic earnings. This disconnect can lead to undervalued stocks and great buying opportunities for investors. 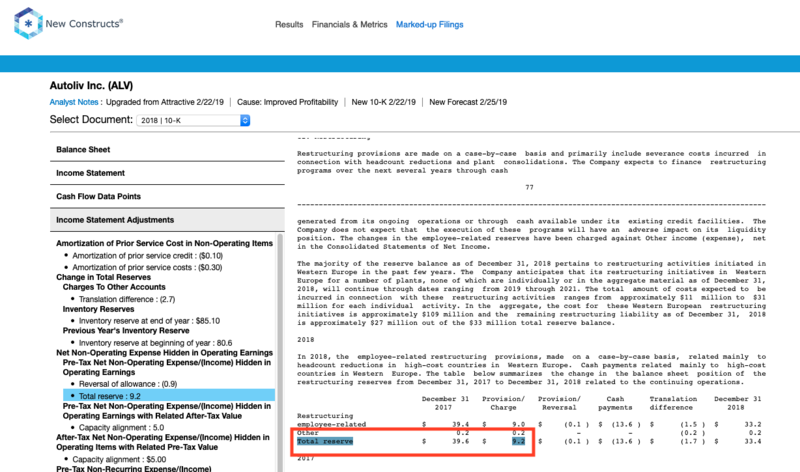 Our analysis of footnotes is critical to finding disconnects between reported and economic earnings. Autoliv Inc. (NYSE:ALV) and Westlake Chemical Corp. (NYSE:WLK) are this week's Long Ideas. We upgraded Autoliv to Very Attractive (from Attractive) after we analyzed its 2018 10-K.
ALV is down 23% (vs. S&P +1%) over the past year and the company missed consensus EPS expectations in three of the past four quarters. 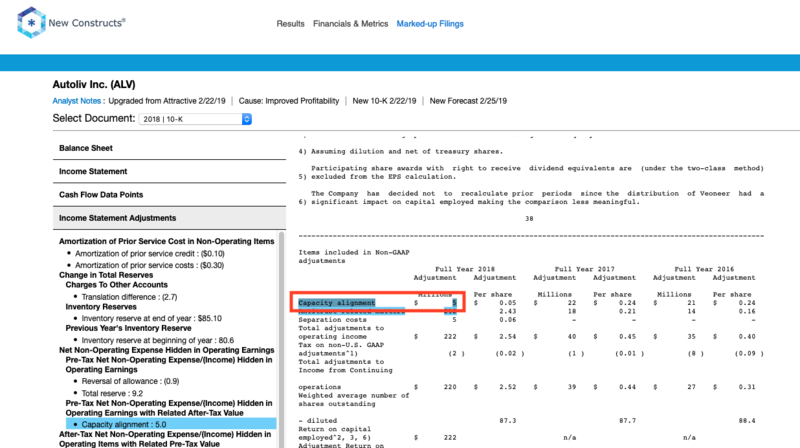 We dug through the footnotes of its 2018 10-K and found that these earnings misses are misleading and true profits are on the rise. Understated Profits: In 2018, GAAP net income fell by 55% YoY while economic earnings increased 11% YoY, per Figure 1. 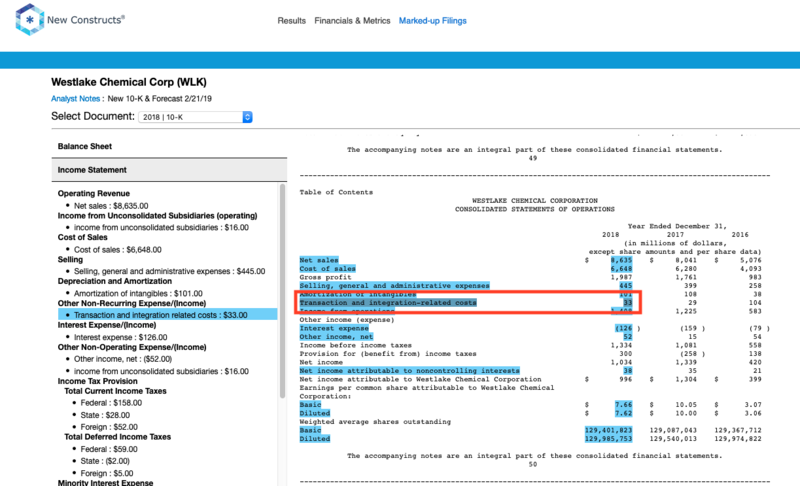 In total, we identified $480 million in net non-operating expenses that must be removed from GAAP net income to calculate ALV's true profits. 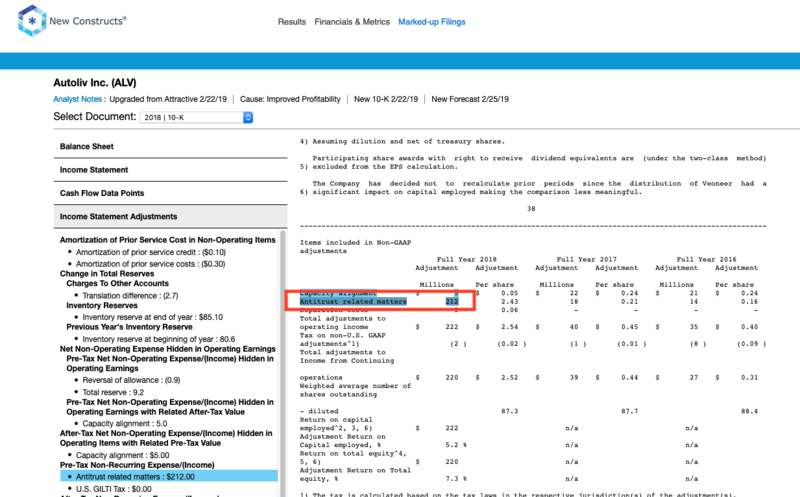 After these adjustments, we found that after-tax operating profit (NOPAT) grew 3% YoY in 2018 compared to GAAP net income down 55%. To get the full picture of a company's operations, one must also account for changes to the balance sheet. In 2018, ALV's invested capital fell 16% YoY. Two of the largest deductions to ALV's invested capital are $236 million (6% of reported net assets) in net deferred tax assets and $182 million (5% of reported net assets) in excess cash. We remove net deferred tax assets and excess cash because they artificially raise reported assets and do not help generate operating profit. Since economic earnings account for the cost of capital, ALV's declining invested capital, combined with its rising NOPAT, drives its 11% increase in economic earnings. The company's return on invested capital (ROIC) increased from 11% in 2017 to 12% in 2018. With such strong fundamentals, ALV is well positioned to capitalize on an automotive safety market that is projected to grow 9% compounded annually through 2025, according to MarketsandMarkets, a business research provider. The company holds a commanding 40% share of the passive safety market, which includes products such as airbag systems, seatbelts, and steering wheels. Joyson Safety Systems is second with 24% and ZF Friedrichshafen is third with 17%. ALV already provides safety products to the majority of the top global auto manufacturers, and 2019 will see the launch of Autoliv supplied automobiles such as the Honda CR-V, Volkswagen Passat, Nissan Altima, and the Audi Q3. Investors Overlook Undervalued Shares: Because of the understated earnings noted above, investors using flawed valuation metrics, such as P/E, are fooled into thinking ALV is significantly overvalued. Its P/E ratio of 38 is well above the Consumer Cyclical industry average of 19 and the S&P 500 average of 21. However, when we remove accounting distortions and look at the expectations implied by the stock price, ALV appears significantly undervalued. At its current price of $81/share, ALV has a price-to-economic book value (PEBV) ratio of 0.9. This ratio means the market expects ALV's NOPAT to permanently decline 10% from current levels. This expectation seems pessimistic given that ALV has grown NOPAT by 2% compounded annually over the past five years and 8% compounded annually over the past decade. If ALV can simply maintain 7% margins (average of last five years, compared to 8% in 2018) and grow NOPAT by just 2% compounded annually for the next decade, the stock is worth $102/share today - a 24% upside. See the math behind this dynamic DCF scenario. Such a scenario could prove conservative as well, even as IHS Markit Automotive, an industry research provider, projects global light vehicle production to grow just 1% in 2019. In its 4Q18 conference call, ALV's management noted the company outgrew light vehicle production by 6% in 2018 and they expect to outpace vehicle production by a similar amount in 2019. Outpacing industry growth could lead to even faster profit growth and boost an already undervalued stock. Westlake Chemicals continues to earn a Very Attractive rating after we analyzed its 2018 10-K.
WLK is down 36% (vs. S&P +1%) over the past year as the market weighs Chinese tariffs and industry supply concerns. We dug through the footnotes of its 2018 10-K and found that reported earnings are significantly understated and that despite macro concerns, the true profits of the business continue to rise. Understated Profits: In 2018, GAAP net income fell by 24% YoY while economic earnings increased 49% YoY, per Figure 2. 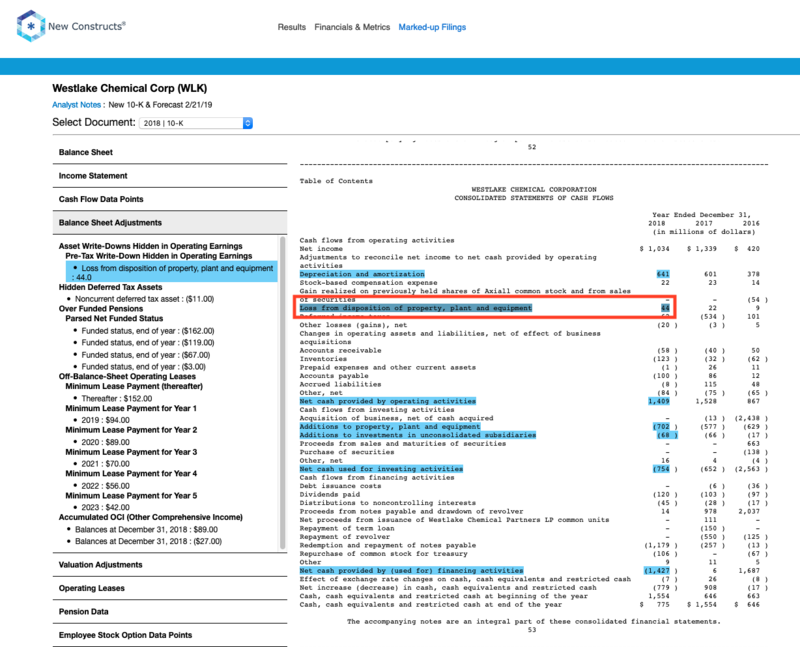 In total, we identified $141 million in net unusual expenses in operating earnings that must be removed to calculate WLK's true after-tax operating profit. 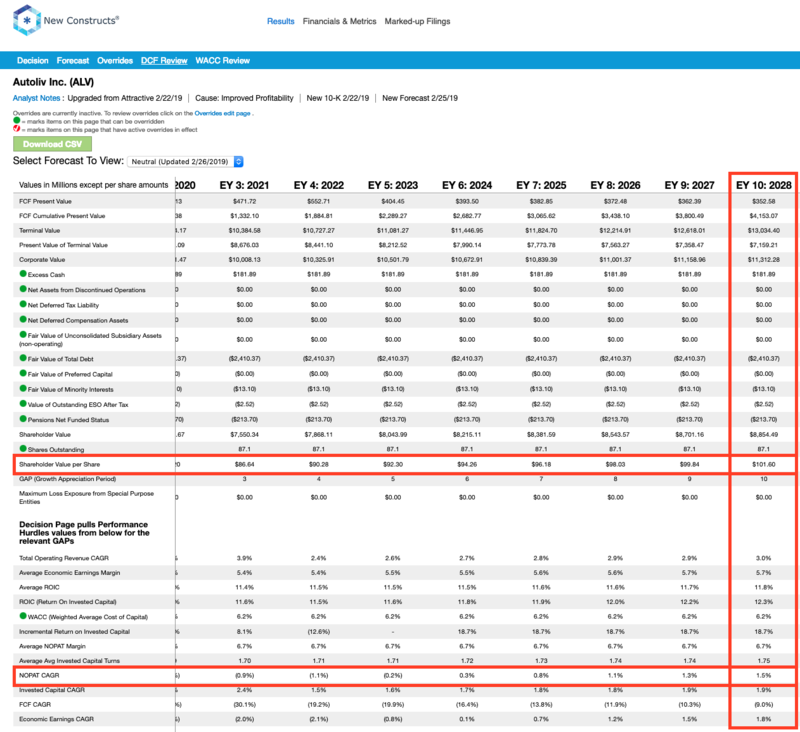 After these adjustments, we found that NOPAT grew 21 % YoY in 2018 compared to GAAP net income down 49%. Even more impressive, WLK was able to generate higher NOPAT without significantly increasing its capital base. In 2018, WLK's invested capital grew just 2% YoY, which is slower than reported net asset growth of 3%. The largest deduction to WLK's invested capital is $504 million (5% of reported net assets) in excess cash. Without making this adjustment, our calculation of invested capital, and subsequently ROIC, would be distorted by past profits and not reflect the ongoing operations of the business. Relatively flat invested capital and rising NOPAT led to the significant increase in economic earnings noted above in Figure 2. 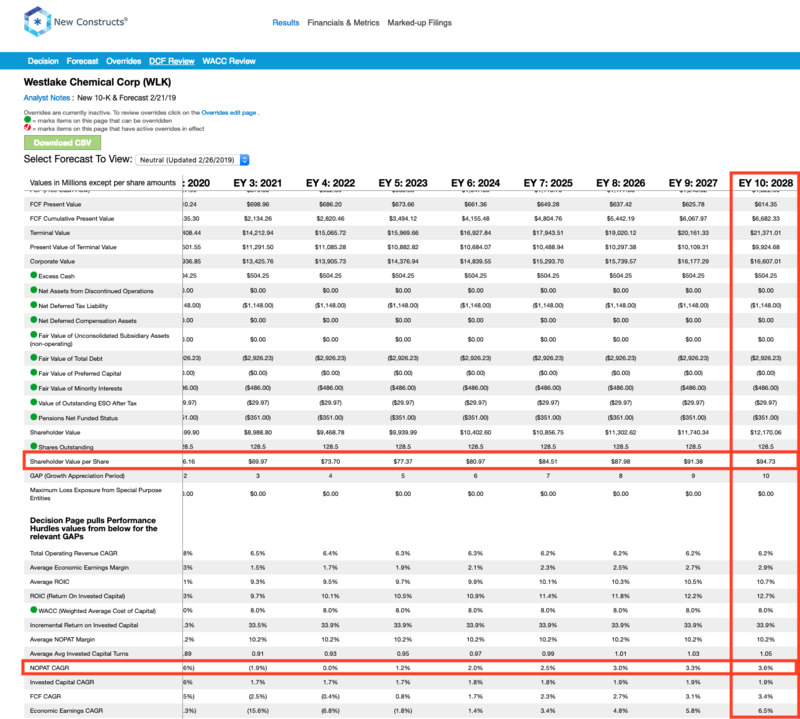 Beyond economic earnings, WLK's NOPAT margin and ROIC also improved in 2018. NOPAT margins increased from 12% to 13% YoY while ROIC improved from 9% to 11% over the same time. Rising economic earnings would seem to fly in the face of the larger industry narrative that China tariffs and oversupply will negatively impact WLK's profits. While these are undoubtedly real concerns, the disconnect in rising profits and market fears can be attributed to WLK's small overall exposure to China. As management noted in the 2Q18 conference call, WLK "does not export much to China." In fact, just 2% of sales were to Chinese customers in 2018. However, these concerns have dropped valuations across the industry and WLK now trades at a price where excessive downside is priced in to the stock. Shares Are Undervalued: WLK looks undervalued whether we use traditional metrics or analyze the expectations baked into the stock price. At its current price of $74/share, WLK has a PEBV ratio of 1.0. This ratio means the market expects WLK's NOPAT to never meaningfully grow from current levels. This expectation seems rather pessimistic given that WLK has grown NOPAT by 12% compounded annually over the past five years and 15% compounded annually since 2004. Even if we assume global oversupply leads to WLK's NOPAT margin falling to 10% (lowest in past seven years, down from 13% in 2018), if the company can grow NOPAT by just 4% compounded annually for the next decade, the stocks is worth $95/share today - a 28% upside. See the math behind this dynamic DCF scenario. Best of all, investors can rest easy knowing that their interests' are also aligned with executives' interests. Executives' annual and quarterly bonuses are both tied to meeting a target return on capital employed (ROCE), which is similar to ROIC. ROCE has been a part of Westlake Chemical's executive compensation plan in some form since 2009. The focus on improving ROCE, much like ROIC, aligns the interests of executives and shareholders, helps to ensure prudent stewardship of capital, and lowers the risk of investing in the business. Question: Why does reading footnotes matter? Answer: To find hidden gems the market has overlooked. ALV and WLK represent just two of the multiple examples where items hidden in footnotes or the MD&A have a material impact on profitability. Without this diligence, investors receive a misleading picture of company profits. Our analysts leverage our cutting edge Robo-Analyst technology to uncover unusual items hidden in the footnotes and make our models the best in the business. Our analysts work directly with our engineers to make our Robo-Analyst machine learning system smarter with every filing it reads so we can automate more of the analysis and empower our analysts to find more in the footnotes. This article originally published on February 27, 2019. Ernst & Young's recent white paper, "Getting ROIC Right," proves the superiority of our research and analytics.